The Vinca Culture (Old Europe). Location: South-eastern Europe, Centred on Serbia. Grid Reference: (Vinca): 44° 49' N. 20° 28' E.
The Vinča Culture: ('Old Europe'). The Vinca culture flourished from 5,500 (2) to 3,500 BC (4) on the territories of what is now Bosnia, Serbia, Romania and Macedonia. It got its name from the present-day village of Vinca, 10 km east of Belgrade on the Danube river, where over 150 Vinca settlements have been determined. There is no evidence of war or defences in the townships, and it appears that the Vinca were a peaceful society combining low-level agriculture with foraging and trade. They produced the first known European examples of a 'proto'-script and were the first people in the world known to smelt copper. They existed in a similar state for almost 2,000 years, following which they appear to have dispersed around the Mediterranean and Aegean. Vinča settlements were considerably larger than any other contemporary European culture, in some instances surpassing the cities of the Aegean and early Near Eastern Bronze Age a millennium later. The largest sites, some more than 300,000 square metres may have been home to up to 2,500 people. (2) We are told that they lived in spacious housing and separated their dead in nearby necropolis. They had workshops, which means skilled labour. 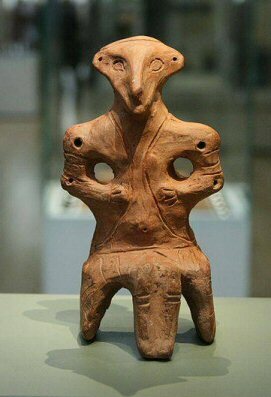 They worked with several styles of pottery and had their own particular artistic fingerprint which is seen in both early Cretan and Sumerian cultures, which rose following the demise of the 'Old Europe' heartland. Copper working had been in progress in nearby Anatolia (Turkey), for well over 1,000 years before it appeared in Europe (5). One of the most exciting finds for archaeologists therefore, was the discovery of a sophisticated metal workshop with a furnace and tools including a copper chisel and a two-headed hammer and axe. "This might prove that the Copper Age started in Europe at least 500 years earlier than we thought,". The Copper Age marks the first stage of humans' use of metal, with copper tools used alongside older stone implements. 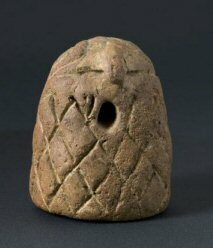 It is thought to have started around the 4th millennium BC in south-east Europe, and earlier in the Middle East. The discovery of a mine - Europe's oldest - at the nearby Mlava river suggested at the time that Vinca could be Europe's first metal culture, a theory now backed up by the Plocnik site. "These latest findings show that the Vinca culture was from the very beginning a metallurgical culture," said archaeologist Dusan Sljivar of Serbia's National Museum. "They knew how to find minerals, to transport them and melt them into tools." The metal workshop in Plocnik was a room of some 25 square meters, with walls built out of wood coated with clay. The furnace, built on the outside of the room, featured earthen pipe-like air vents with hundreds of tiny holes in them and a prototype chimney to ensure air goes into the furnace to feed the fire and smoke comes out safely. He said the early metal workers very likely experimented with colourful minerals that caught their eye -- blue azurite, bright green malachite and red cuprite, all containing copper -- as evidenced by malachite traces found on the inside of a pot. 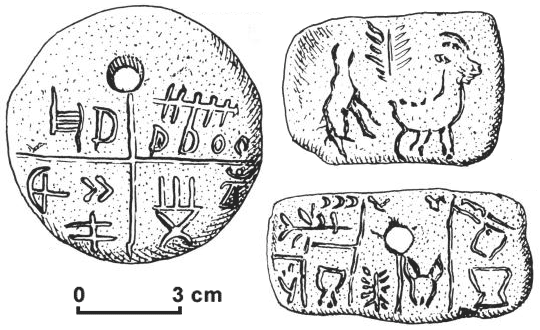 The tablets, dated to around 5,300 BC (2), bear incised symbols - the Vinča symbols - and have been the subject of considerable controversy among archaeologists, some of whom claim that the symbols represent the earliest known form of writing in the world. 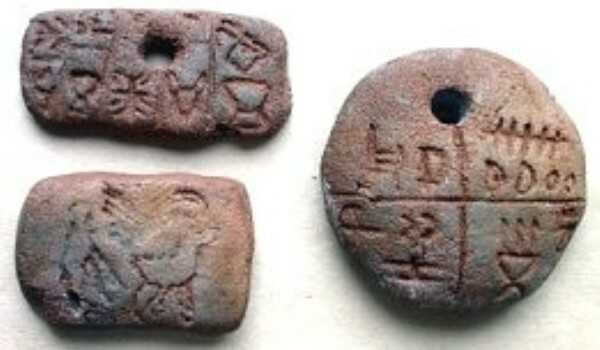 subsequent radiocarbon dating on the Tărtăria finds pushed the date of the tablets (and therefore of the whole Vinča culture) much further back, to as long ago as 5,500 BC, the time of the early Eridu phase of the Sumerian civilization in Mesopotamia. This finding has reversed our concept of the origin of writing, and it is now believed that the Sumerians inherited a Vinca tradition of 'magical' or 'meaningful' scripture, probably following the collapse of the Vinca homeland c. 3,500 BC. 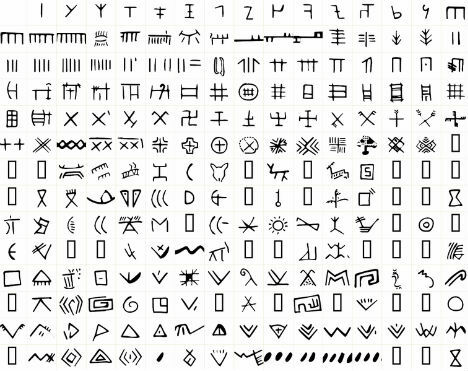 Full list of Vincan Symbols. 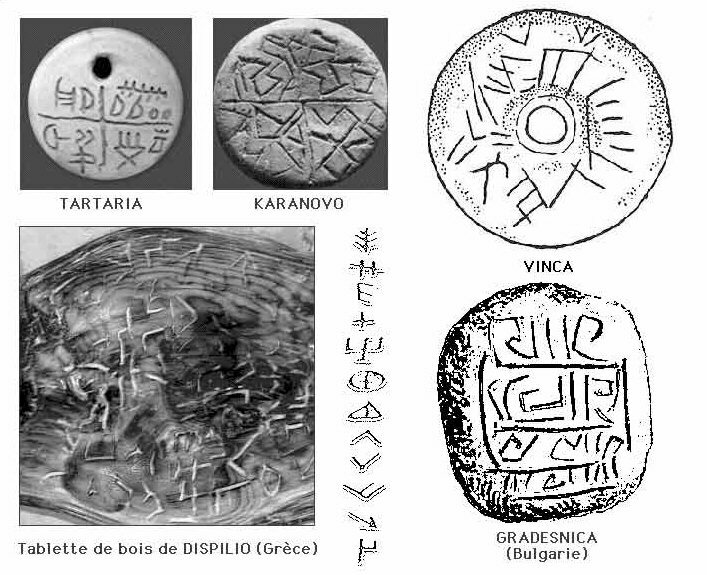 Article: (June 13, 2008): 'Europe’s Oldest Script Found in Bulgaria', 18 May 2005. Article: Old Linear and the Zodiac Signs. Richard. D. Flavin, 1998. Recent excavations at sites across Europe's biggest prehistoric civilization, the Vinca culture, point to a great degree of sophistication and a taste for art and fashion, archaeologists say. "According to the figurines we found, young women were beautifully dressed, like today's girls in short tops and mini skirts, and wore bracelets around their arms," said archaeologist Julka Kuzmanovic-Cvetkovic. The Vinca tribe who lived between 5,400 and 4,700 BC in the 120-hectare site at what is now Plocnik knew about trade, handcrafts, art and metallurgy. 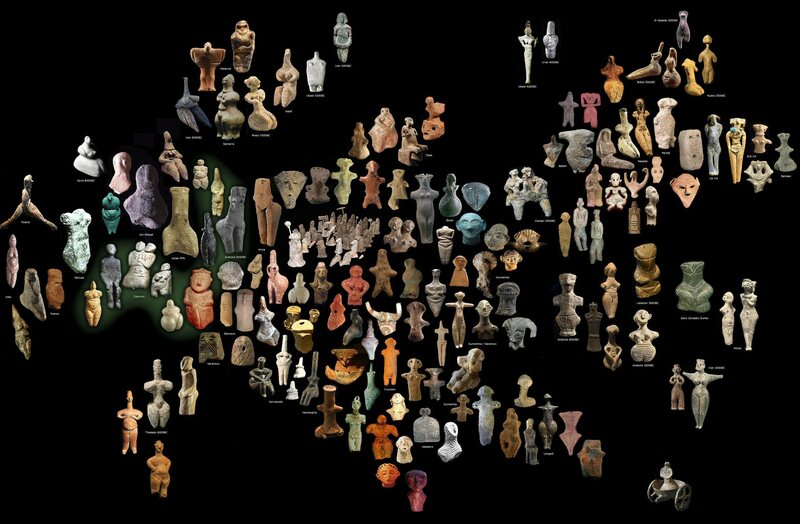 "They pursued beauty and produced 60 different forms of wonderful pottery and figurines, not only to represent deities, but also out of pure enjoyment," said Kuzmanovic. The findings suggest an advanced division of labour and organization. Houses had stoves, there were special holes for trash, and the dead were buried in a tidy necropolis. People slept on woollen mats and fur, made clothes of wool, flax and leather and kept animals. What we have then is the record of a civilisation that flourished in Europe between 6,000 and 3,500 BC and which appears to have enjoyed a long period of uninterrupted and peaceful living. The 'Old European' Vinca pottery, artefacts and writing all show an immediately noticeable similarity to what was originally thought to be an earlier Ubaid Sumerian influence from the middle east. 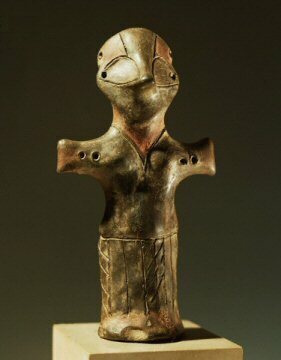 In addition, the Cycladian/Cretan cultures are suspected of having close close artistic and possibly religious connections with the Vinca. Both of these cultures appeared following the demise of the Old European Heartland, perhaps not so coincidentally, at the same time as several other important civilisations (Egyptian, Indus Valley, Western European, Maltese Etc) appeared in the prehistoric record. 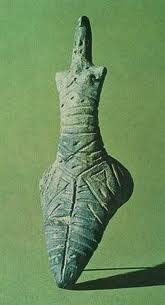 The Vinca pottery (above) is almost indistinguishable from Ubaid Sumerian. 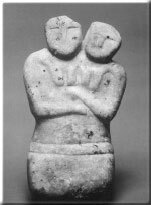 Several eminent archaeologists of the time (such as Childe, Hood, Vlassa, Maccay), were convinced that the Vinca had somehow been influenced or 'cradled into being' by the mistaken belief at the time that the Sumerians were the 'Mother race'. However, much to everyone surprise, more recent discoveries of earlier Vinca settlements have shown quite clearly that events must have occurred the other way round as the Old European settlements, along with writing, pottery, metallurgy and 'Ubaid' style art, date to a thousand years before the first Sumerian fingerprint, suggesting remarkably that it was actually a Western European culture that influenced Sumerian development. 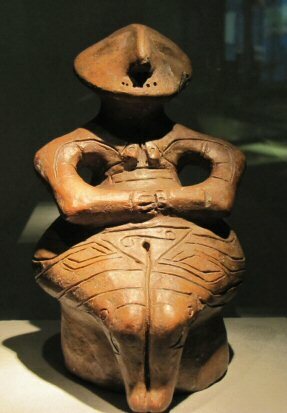 The Vinca sculptures (above) show strong symbolic similarities to later Cretan 'Mother-Goddess' figurines and what might be the earliest representation of an 'Omphalos'. 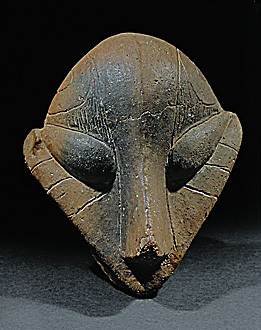 Other similarities with cultures that followed the Vinca's demise have been noted such as the rise of the so-called Cycladic and Cretan cultures, where the new settlers arrived around 3,200 BC. with identical motifs such as the snake, intertwined with the bird goddess motif, the bee and the butterfly, with the distinctive motif of the double axe, are found both in 'Old Europe' and Crete. But the best evidence is in the writing of Old Europe and the 'Linear A' script of Crete, which are to all intents and purposes identical. 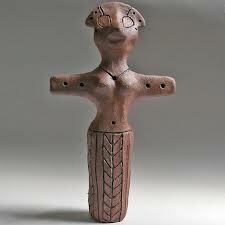 Gallery of Images: Vinca Culture. 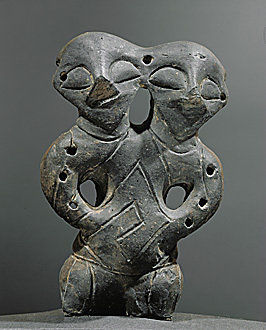 Left: Double-headed figure from Gomolava-Hrtkovci, Serbia. 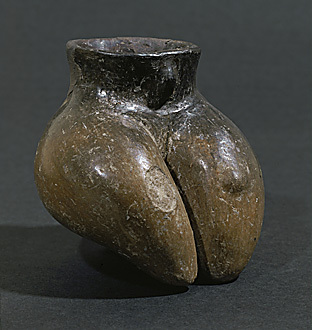 Vinca-Plocnik Culture, Late Mesolithic (5th mill. BC). (Photo Credits: Carlos Mesa) Right: Double-Headed figure, Cayonu, Turkey. Anatolian Culture (6th Millennium BC). 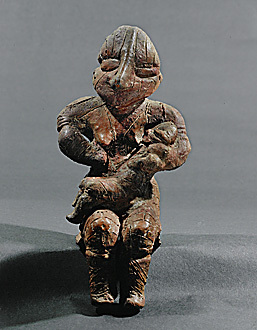 Seated Vinca Figurines. (Right) Mother and Child.